This book is a series of short stories from the Beechwood Harbor Mysteries series. It also introduces us to a new character to Beechwood Harbor for a spinoff series, Beechwood Harbor Ghost Mystery. I think you can listen to most of these stories without having read the series, though the last story does have spoilers if you’re not caught up with the series. Don’t worry, the author warns you with her introduction to that story. She does an intro to each short. I had a lot of fun with these little peeks into Beechwood Harbor. I love that we get to spend more time with side characters that maybe don’t get as much page time in the main series. This story is a prequel to the Beechwood Harbor Mysteries. It gives us the story about how Holly ends up a disgrace in the havens and banished to Beechwood Harbor. This goes into much more detail than what is told in the first book, when we learn what happens to her. This is a Halloween story. Lacey throws a Halloween party at the manor for her vampire friends. But humans show up, which isn’t good. They’re not supposed to know about the supernatural. This is obviously a Thanksgiving story. Holly is hosting Thanksgiving Day dinner at the manor. It will include both humans and the supernatural. Cassie and her family come and she seems to keep inviting everyone from Beechwood Harbor. This story is prequel to Beechwood Harbor Ghost Mysteries. We get to meet Scarlet. She’s human, but she’s able to see ghosts. We don’t really know why, but she does. She owns a florist shop in Beechwood Harbor and holds a ghost support group in town. We also get to see much more Posey, manor’s ghostly landlord. Again, Holly and Scarlet are working together to save Christmas from an elf who is causing nightmares in the children around the town. So this is a brand new story for this book (though I’ve not read any of these stories prior to listening to this anthology). This one takes place as a prequel and how Holly finds her familiar and tabby cat named Boots. This story takes place after Lucky Witch (Beechwood Harbor Mysteries #5). Don’t read this story if you don’t want spoilers because there is a big one. This is another brand new story for this anthology. Nick takes a case that the police can’t solve in order to save his business. Amanda Ronconi continues to do an amazing story with the narration of this series. I don’t know what I can say about her that I haven’t said a thousand times. Just know that she is one of my all-time favorite narrators. She does a lot of funny stories, so I always get excited when I see something I might like and she’s the narrator. From a young age, Danielle Garrett was obsessed with fantastic places and the stories set in them. As a lifelong bookworm, she’s gone on hundreds of adventures through the eyes of wizards, princesses, elves, and some rather wonderful everyday people as well. Danielle now lives in Oregon and while she travels as often as possible, she wouldn’t call anywhere else home. She shares her life with her husband and their house full of animals, and when not writing, spends her time being a house servant for three extremely spoiled cats. 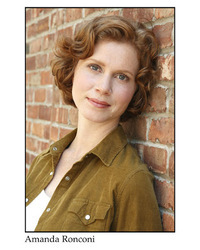 I am an actress, narrator and writer who divides my time between New York City and Upstate New York. I have a BFA from NYU where I studied at the Stella Adler Conservatory. I have performed in theaters around New York City as well as regionally at The Alley, Capital Rep and many productions at the Shakespeare Theatre of New Jersey. My Off-Broadway solo comedy, Shirley at the Tropicana, received critical acclaim and was subsequently featured in The New York Times. Film and TV credits include Daydream Believer (Slamdance 2001’s Best Dramatic Feature winner), The Understudy, Deadly Sins (ID Discovery), IFC’s Get Hit and Chasing Paradise. National network and regional commercials include Chase Bank, Sony and Blue Cross/Blue Shield. My voiceover work encompasses over 70 audiobooks available on Audible.com. I need to try this genre! I’ve had a great time with it. I need to try more of it. Oh this sounds so good Melanie thanks! It’s a really cute series. I jumped in with the spinoff series. I want to come back to the first series eventually. I do love it that all the novellas are gathered up here. Of course Amanda Ronconi makes it even better. The spinoff series is fun too (or at least the first book was, I have book two to try soon). Even though I don’t read a lot of cozy mysteries anymore, this sounds cute and fun but not too cutsey! It isn’t too cutsey for sure. Cute, but not overly so. I have this but all the audiobooks I requested came in at the same time..bwahaha. Why does that happen? I am looking forward to these. Thanks, Angela. I’ve enjoyed the series so far. This is the first series that I’ve done with her. I’m really enjoying her. These sound good. I hadn’t heard about this collection before. It is a fun series. I hope you get a chance to try her. This sounds like such a fun series. I think that a book of short stories would be great to listen to. I do love the anthologies for a series. I’ve read a few from different authors. I love the glimpses into side characters and parts of life of the main characters that don’t make it into the full length novels. Nice review. This was a fun anthology of stories from the series. I’ve finished the first Ghost book and hope it becomes a favorite like Holly’s stories. Me too. I have the second book in the ghost series, but I haven’t listened to it yet. Soon. Looks like this is the perfect companion read to the Beechwood Harbor Mysteries. I don’t believe I’ve listened to Amanda Ronconi’s narration before, but it sounds like she’s fabulous! Will have to fix that! She is a favorite narrator of mine. She’s great with the fun and funny stories. She does all of Molly Harper’s books, too.